A colt from The Castlebridge Consignment and by first-crop yearling sire Night Of Thunder (Lot 11), Godolphin's 2,000 Guineas and Lockinge Stakes winner by Dubawi, topped the first day of the Tattersalls Ireland September Yearling Sale 2018. 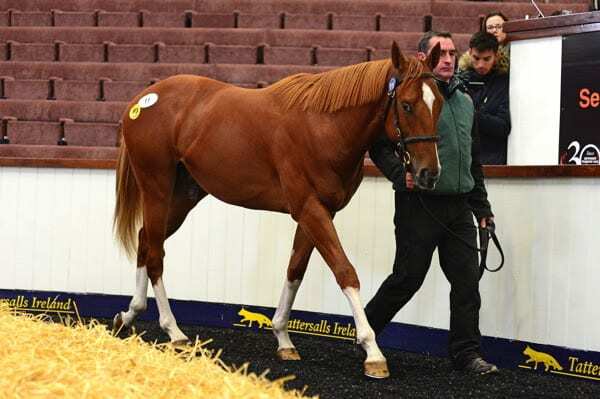 The colt, a three parts brother to Dubawi's Group 1 victor Prince Bishop, winner of the Dubai World Cup (G1) for Godolphin, sold for €180,000 and was purchased by bloodstock agent Anthony Stroud on behalf of Godolphin. “This is a lovely, easy moving, athletic son of Night Of Thunder, he is a very nice colt and with the connections it made sense to buy,” said Stroud. Eamonn Reilly of BBA Ireland went to €100,000 for Lot 193, a Lynn Lodge Stud consigned son of Kodiac. Dermot Farrington went to €85,000 for a daughter of Showcasing (Lot 188), a half-sister to two black-type runners and sold by Castledillon Stud, while Matt Coleman purchased a War Command colt from Castlehyde Stud on behalf of trainer Jonjo O'Neill (Lot 216). The day produced aggregate sales of €5,171,000 with a clearance rate of 77 per cent. The average price was €25,224 and the median €20,000. Tattersalls Ireland September Yearling Sale continues tomorrow at 10am, and concludes with Part II on Thursday, 27 September. All lots are eligible for the €300,000 Tattersalls Ireland Super Auction Sales Stakes 2019. This entry was posted in Bloodstock and tagged anthony stroud, BBA Ireland, dermont farrington, e Five Racing, eamonn reilly, Godolphin, kodiac, night of thunder, Prince Bishop, Tattersalls, Tattersalls Ireland, yearling by Press Release. Bookmark the permalink.